We came up with the idea after we realised that much of our daily motion is wasted. We then thought of ways that we could harvest energy from our daily activities, like walking, running, cycling etc. 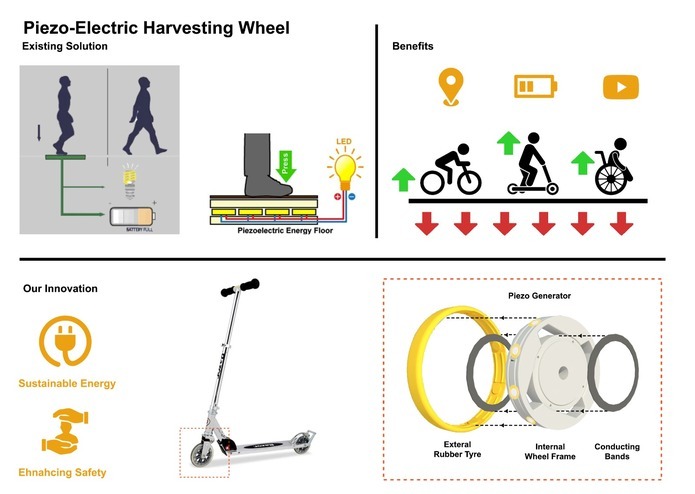 We then decided to consider how energy may be harvested from scooters as the wheel turns at a high RPM and this offered a lot of potential. It was also a vehicular platform that none of the team had experience in modifying. Thus, we decided to take up the challenge and see how the energy from the rotational motion of the wheel can be harvested to generate electricity. Our team recognises the increasing trend of personal mobility devices not just in Singapore but in the world. Thus, we aim to modify the wheels of all personal mobility devices in the future. This could potentially scale from powering safety devices like front lights, wirelessly charging mobile devices to reducing the overall energy consumption globally. When the wheel spins and is in contact with the ground, the piezos that are embedded in our 3D printed tires are compressed due to the normal contact force from the ground. This generates electricity which goes into our metal disk attached to the wheel's frame. 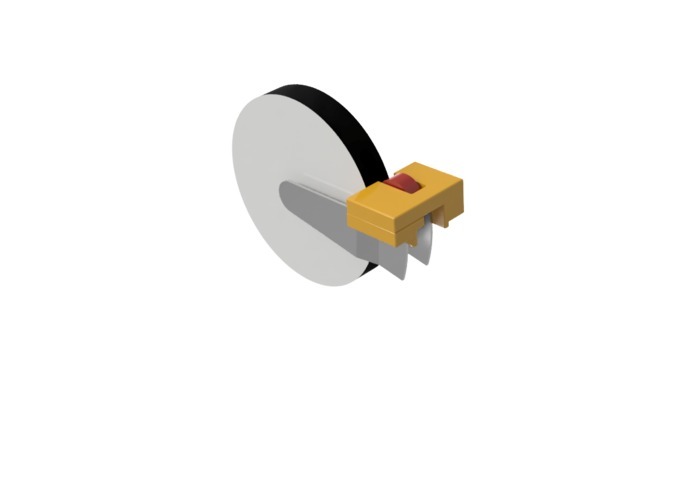 Wires then connect it to our circuit board where there is full wave rectification before the energy goes to power LEDs. We built it in 24 hours at the NUS Hack & Roll. We knew that we may have needed to 3D print items and thus, one of our teammates brought his own 3D printer to ensure that we could have 24 hour access to the printer without having to queue for the general printer. When the competition started, we immediately split into 3 teams, cading, hardware and electronics. 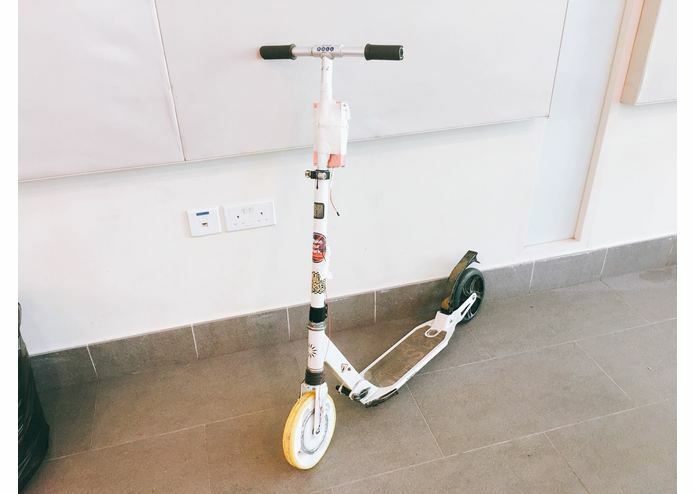 We disassembled the scooter and started 3D modelling quickly and also began testing the piezos in series to increase the voltage generated. 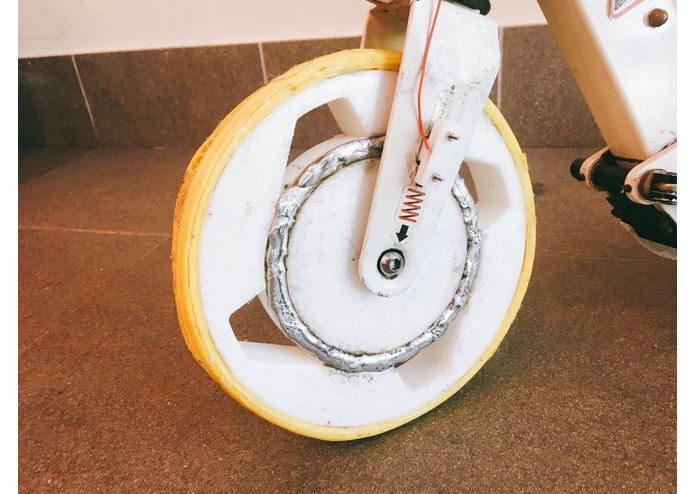 We decided to use the front wheel because we observed that the body weight of a skater is at the front of the scooter and this could potentially apply more pressure on the piezos which was shown to generate a higher voltage. 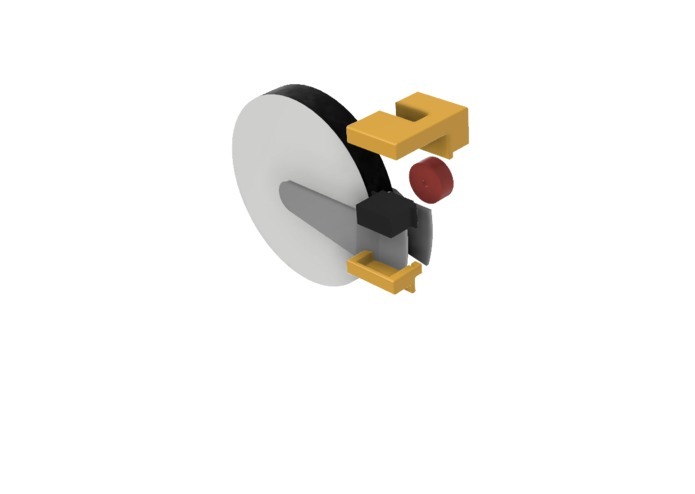 We 3D modelled a new frame for the wheel with holes for the piezo wire. We also 3D modelled a tire for the wheel with slots for each of our 7 piezos. We utilised solder, wire, nuts and bolts provided at the competition to link everything together. One of the challenges we ran into was that the 3D printer (Both the competition's one and ours) kept breaking down. This caused us to change our plans multiple times and adjust our timeline. We spent a considerable amount of time fixing the 3D printers. In the end, some of the parts could not be printed due to the lack of time and working 3D printers. we then proceeded to be creative and use the left over materials like cardboard from drink packets, aluminium from empty coke cans and even stripping wires to get the metal pieces we needed for the connection to our carbon brushes. Improvisation is key. 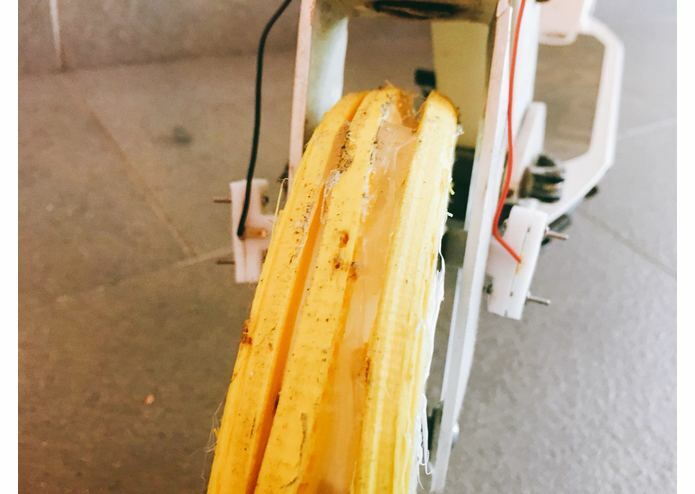 We're proud that we managed to develop a scooter that achieved all our desired functions despite having the lack of desired materials and a tight schedule. We learned a lot in the field of creativity and improvisation, learning that if there is a will, there is a way. The most important thing we took away is the ability to improvise and think out of the box which is the fun part about engineering. Most of the time there will be unforeseen circumstances and the real test is to work under pressure to think creatively to address these problems.